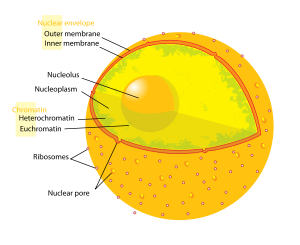 The nucleolus (plural nucleoli) is a large, distinct, spheroidal subcompartment of the nucleus of eukaryote cells that is the site of ribosomal RNA (rRNA) synthesis and assembly of ribosomal subunits. 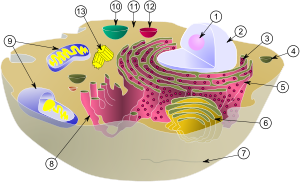 A nucleoli sometimes is referred to as a "non-membraneous organelle" or "nuclear membraneless organelle" in the broader sense of the term organelle; however, nucleoli lack a membrane and thus are not organelles in the more technical sense of structures that are separately enclosed within their own lipid membrane. Most plant and animal cells have one or more nucleoli, but some cell types do not have any. The nucleolus is a highly dynamic structure from which the components are dispersed at the onset of mitosis and are reassembled at the end of cell division. This intricate body works in cooperation with other nuclear components to provide a valuable function for the cell. However, when this complex coordination in human cells is disrupted, such as by viral infection, congenital mutations, or increased activity, several human diseases can result. The nucleolus is a large and distinct nuclear structure that is highly organized and lacks a membrane. The main function of the nucleolus is the biogenesis and assembly of ribosome components (rRNA, ribosomal proteins). This site of ribosomal DNA (rDNA) transcription has been referred to as a "ribosome-producing machine" (Alberts et al. 1989). The nucleolus can be visualized through electron microscopy while the organization and dynamics can be studied through Fluorescent Protein Tagging and Fluorescent Recovery after Photobleaching (FRAP). In a non-mitotic cell, observed under a light microscope, the nucleolus is the most obvious structure in the nucleus (Alberts et al. 1989). However, during the initial stages of cell division, nucleoli are fragmented (they can no longer be seen in metaphase). At the transition between telophase and interphase. they reassemble around the chromatin regions where rDNA transcription is reinitiated. The rDNA sequences encode the rRNA (ribosomal RNA) molecules of the ribosomes. Instead of being bound by a membrane, the nucleolus appears to be constructed from the specific binding together of unfinished ribosome precursors, forming a large network (Alberts et al. 2004). Three regions of a nucleolus can be distinguished: a fibrillar center (which contains DNA that is not actively being transcribed), a dense fibrillar component (contains RNA molecules being transcribed), and a granular component (contains maturing ribosomal precursor particles) (Alberts et al. 1989). This later region helps make the border with the surrounding nucleoplasm distinct, despite the lack of a membrane. Since nucleoli carry out the production and maturation of ribosomes, large numbers of ribosomes are found inside them. In addition to ribosome biogenesis, nucleoli are believed to have other roles in cellular activity. Additionally, according to recent research, the nucleolus is also responsible for the trafficking of various prominent small RNA species. The nucleolus helps them during their maturation process and route to their final cellular destination. Moreover, although nucleoli become invisible during cell division, recent studies have found that they are involved in cell cycle regulation. Several of its non-traditional roles include interaction with viral components, the regulation of tumor suppressor and oncogene activities, signal recognition particle assembly, the modification of small RNA strands, the control of aging, and modulating telomerase function. Early cytologists were so interested in the easily seen nucleoli that a 1898 review listed about 700 references (Alberts et al. 1989). Cytologists demonstrated by the 1940s that nucleoli contain high concentrations of RNA and proteins (Alberts et al. 1989). In 1964, John Gurdon and Donald Brown discovered cell nucleoli in the African clawed frog Xenopus laevis. They found that 25 percent of the frog eggs had no nucleolus and that such eggs were not capable of life. Half of the eggs had one nucleolus and 25 percent had two. They concluded that the nucleolus had a function necessary for life. In 1966 Max L. Birnstiel und Hugh Wallace showed via hybridization experiments that nucleoli code for ribosomal DNA. although the nucleolus is not membrane-bound, due to the presence of GC, the border with the surrounding chromatin and nucleoplasm is usually distinct. A substantial (additional) component of the nucleolus is chromatin, which penetrates the organelle from the surrounding nucleoplasm. A continuous link between the nucleoplasm and the inner parts of the nucleolus exists through a network of nucleolar channels. In this way, macromolecules with a molecular weight up to 2000 kDa are easily distributed throughout the nucleolus. One last structure is identified within the nucleolus and is referred to as a nucleolar vacuole. There are multiple nucleolar vacuoles in the nucleolus, but it remains unclear whether or not they serve some functional or structural purpose. Although the "tripartite’ organization" (FC, DFC, GC) of the nucleolus is commonly accepted, it has been proposed that this particular organization is only observed in higher eukaryotes and that it evolved from a bipartite organization with the transition from anamniotes to amniotes. Reflecting the substantial increase in the rDNA intergenic region, an original fibrillar component would have separated into the FC and the DFC (Thiry and Lafontaine 2005). Nucleolus assembly occurs non-randomly. Nucleoli are formed around specific genetic loci called nucleolar organizing regions (NOR’s). Previously described by McClintock as the "nucleolar organizing element," a NOR is composed of tandem repeats of rRNA genes that are present in multiple copies throughout the genome. The human genome, for example, contains more than 200 copies of the rRNA gene and they are clustered on five different chromosomes. In a typical eukaryote, a rRNA gene consists of a promoter, internal and external transcribed spacers (ITS/ETS), rRNA coding sequences (18S, 5.8S, 28S), and an external "non" transcribed spacer (Alberts et al. 2002). In ribosome biogenesis, three eukaryotic RNA polymerases (pol I, II, III) are required, which function in a coordinated manner. In an initial stage, the rRNA genes are transcribed as a single unit within the nucleolus by RNA pol I. In order for this transcription to occur, several pol I-associated factors and rDNA-specific transacting factors are required. In yeast, the most important are UAF (upstream activating factor), TBP (tata-box binding protein), and CF (core factor), which bind promoter elements and form the pre-initiation complex (PIC), which is in turn recognized by pol I. In humans, a similar PIC is assembled with SLI, the promoter selectivity factor, which is composed of TBP and TBP-associated factors (TAF), IF, the transcription initiation factor, and UBF, upstream binding factor. Transcription of the ribosomal gene yields a long precursor molecule (45S pre-rRNA), which still contains the internal transcribed sapcer (ITS) and external transcribed spaced (ETS). Further processing, which involves methylation and endo/exonuclease activity, is therefore needed to generate the 18S rRNA, 5.8S, and 28S rRNA molecules. The RNA modifying enzymes are brought to their respective recognition sites through interaction with guide RNA’s, which bind these specific sequences. The guide RNA’s belong to the class of small nucleolar RNA’s (snoRNA’s), which are complexed with proteins and exist as small-nucleolar-ribonucleoprotein (RNP) particles (snoRNP’s). Once rRNA is processed, the rRNA molecules are ready to be assembled into ribosomes. However, an additional RNA molecule, the 5S rRNA, is necessary for this biogenesis. In yeast, the 5S rDNA sequence is localized in the external "non" transcribed spacer and is transcribed in the nucleolus by RNA pol III. In higher eukaryotes and plants, the situation is more complex, for the 5S rDNA sequence lies outside the NOR and is transcribed in the nucleoplasm, after which it is imported in the nucleolus to participate in the ribosome assembly. This assembly not only involves the rRNA, but ribosomal proteins as well. The genes encoding these r-proteins are transcribed by pol II in the nucleoplasm by a ‘conventional’ pathway of protein synthesis (transcription, pre-mRNA processing, nuclear export of mature mRNA and translation on cytoplasmic ribosomes). The mature r-proteins are then re-imported into the nucleolus. Association and maturation of rRNA’s and r-proteins result in the formation of the 40S and 60S subunits of the ribosome. These are exported through the nuclear pore complexes to the cytoplasm where they remain free or will become associated with the endoplasmic reticulum (Alberts et al. 2002; Cooper and Hausman 2007). Multiple nucleolar proteins and small nucleolar RNA’s (snoRNA’s) associate to form the processing machinery required in ribosome biogenesis. They are involved in the modification of the nascent rRNA transcripts through methylation (2’-O-methylation/pseudouridylation) and endonucleolytic cleavage of the pre-RNAs. These processing stages are mainly confined in the DFC (dense fibrillar component) as revealed by the presence of these snoRNP (small-nuclear-ribonucleoprotein particles) constituting proteins, for example fibrillarin, nucleolin, and U3 snoRNA. Protein B23 and NOP52, involved in later stages of the processing. are localized in the GC (granular component). This shows that the organization of the nucleoli is highly regulated and dependent on the stages in rRNA processing. These observations have also led to the hypothesis that rDNA transcription has to occur in the FC (fibrillar center) or at the junction between the FC and DFC because of the vectorial outward movement of the pre-RNA transcripts while they are processed to yield mature rRNAs. If one considers the complete set of proteins and RNAs needed in the ribosome biogenesis, we can assume that a nucleolus is simply formed because certain proteins, involved in the transcription of the rDNA genes, bind to their target regions, and that all around them there is a spontaneous assembly of all the elements involved in the modification of the nascent rRNA’s. Therefore, the organization occurs as a consequence of ribosome biogenesis. Several experimental approaches have been used to get a detailed view about this particular assembly process. The most important are Fluorescent Protein Tagging, in which a protein of interest is fused with a fluorescent protein such as "green fluorescent protein" (GFP) and Fluorescent Recovery After Photobleaching (FRAP) which consists of tagging a protein with a fusion protein after which the fluorescent molecules in the area of study are bleached with a laser. The fluorescent intensity of the area under study will recover because of outward diffusion of bleached molecules and inward diffusion of unbleached molecules. The former approach allows one to keep track of the movement of the fluorescent complex (3D+time) and the latter allows measurement of the residence time (time spent in a certain area) of the fluorescent protein (in other words, measuring the intracellular mobility). Both experimental methods rely on the ability of tagging a whole range of nucleolus associated proteins such as nucleolar proteins, histones, DNA binding proteins, transcription factors, and spliceosomes. Tracking and measuring the residence time of the tagged proteins allowed demonstration of the rapid association/dissociation rates of nucleolar proteins with other nucleolar components, the continuous exchange of proteins between the nucleolus and the nucleoplasm during interphase, and the involvement of these nucleolar proteins with other nuclear domains. It has for example been found that Cajal bodies (CB) are enriched in small nuclear and nucleolar ribonucleoprotein and that they contain several nucleolar associated processing proteins such as fibrillarin. Therefore it has been proposed that there should exist a functional relationship between nucleoli and Cajal bodies (Hernandez-Verdun 2006a, 2006b). Several experimental observations indicate that the recruitment of the nucleolus constituting elements occurs non-random and that it is regulated by the cell cycle progression. During mitosis, the transcription machinery stays closely associated with the rDNA. However, the transcription is repressed by the cyclin B/Cdk1 protein kinase complex (PMF). This complex is activated at the onset of mitosis and represses nuclear activities by phosphorylating a number of protein kinases or structural proteins involved in the cellular rearrangements needed for proper cell division. It is at the end of mitosis, when the PMF is degraded through proteolytic cleavage of cyclin B, that nucleoli reassemble around the rDNA sites in a response to the re-initiating of rDNA transcription. The nucleolar proteins are, in contrast to the proteins involved in the transcription, localized at the periphery of the chromosomes during the M phase of the cell cycle. This can be visualized by Fluorescent Protein Tagging. At the transition of telophase to G1, the majority of them are grouped into Prenucleolar Bodies (PNB). It is these PNB that perform the translocation from the chromosomes to the sites were rDNA transcription has started. The PNB’s are thought to function as an assembly platform and as a reservoir for protein complexes, which release the processing proteins at the sites of rDNA transcription. Early processing proteins, such as fibrillarin, are recruited in a response to a decrease in cyclin B/Cdk1 activity, whereas late processing proteins, such as B23 and Nop52, are recruited in a response to cyclin dependent kinase (cdk) activity. In this way, the various processing protein can be released exactly at the time they are needed during rRNA synthesis (Hernandez-Verdun 2006a, 2006b). Human diseases associated with a malfunction of the nucleolus can be caused by viral infections, increased nucleolar activity, or simply by congenital mutations affecting the nucleolar proteins. If a virus contains a nucleolar targeting signal (NOS) in its genome, some viral particle will be directed towards the nucleolus. Such is the case with the human immunodeficiency virus (HIV), which directs the HIV-1 Rev protein to the nucleolus. Through interaction with the B23 nucleolar protein, it serves its purpose by regulating the splicing pattern of the HIV-1 mRNA, for it promotes the export of unspliced mRNA to the cytoplasm. It has been proposed that the Rev protein is localized in the nucleolus to provide an alternative translocation pathway for viral (unspliced/partially spliced) mRNA from the nucleoplasm to the cytoplasm. In this way, the viral mRNA is protected against degradation (which would normally take place to protect the cell against the translation of pre(unprocessed)-mRNA). An increased nucleolar activity will have an effect on the overproduction of ribosomes, which eventually will lead to tumorgenesis and cancer. A key factor in these dysfunctional nucleoli is the protein c-myc, product of the c-myc-proto-oncogene. It stimulates the ribosome biogenesis by directly regulation pol I, influencing the transcription of pol II, III and by associating with the SL1 component of the pre-initiation complex, which increases the efficiency of the recruitment of pol I to the pre-initiation complex. In addition, several congenital mutations affecting the nucleolar proteins have been described: Weine syndrome, Treacher Collins syndrome, and dyskeratosis congenital syndrome (Hernandez-Verdun 2006a, 2006b; Raška et al. 2006). Nucleolar dominance has also been shown for rRNA genes. In some organisms, particularly plants, when two nuclei are combined into a single cell during hybridization, the developing organism can "choose" one set of rRNA genes for transcription. The rRNA genes of the other parent are suppressed and not generally transcribed, though reactivation of the suppressed or "inferior" rRNA genes may occasionally occur. This selective preference of transcription of rRNA genes is termed nucleolar dominance. Cooper, G. M., and R. E. Hausman. 2007. The Cell: A Molecular Approach. Washington, DC: ASM Press. ISBN 9780878932191. Hernandez-Verdun, D. 2006a. [http://www.springerlink.com/content/75n545v0g3186830 Nucleolus: From structure to dynamics. Histochem Cell Biol 125: 127-137. Retrieved July 8, 2008. Hernandez-Verdun, D. 2006b. The nucleolus: A model for the organization of nuclear functions. Histochem Cell Biol 126: 135-148. Retrieved July 8, 2008. Khadzhiolov, A. A. 1985. The Nucleolus and Ribosome Biogenesis. Wien: Springer-Verlag. ISBN 3211817905. Olson, M. O. J. 2004. The Nucleolus. Georgetown, TX: Landes Bioscience/ Eurekah.Com. New York: Kluwer Academic/Plenum Publishers. ISBN 0306478730. Olson, M. O. J., and M. Dundr. 2005. The moving parts of the nucleolus. Histochem Cell Biol 123: 203-216. Retrieved July 8, 2008. Raška, I., P. J. Shaw, and D. Cmarko. 2006. New insights into nucleolar architecture and activity. International Review of Cytology 255: 177-235. Retrieved July 23, 2008. Thiry, M., and L. J. Lafontaine. 2005. Birth of a nucleolus: The evolution of nucleolar compartments. Trends in Cell Biology 15 (4). Retrieved July 8, 2008. Thiry, M., and G. Goessens. 1996. The Nucleolus During the Cell Cycle. New York: Springer; Austin, TX: R.G. Landes. ISBN 3540613528. Nucleolus under electron microscope II. This page was last modified on 14 December 2018, at 15:46.